After their last match against Groningen, Ajax have won 11 consecutive games in the Eredivisie. Ajax have gained 67 points so far, and now they are sitting on the top of the table with 6 points ahead from AZ. Only 3 games are remaining, which means Ajax need only 4 points to secure their league title. The entire team is in good form these days. Boerrigter, Sigthorsson and Van der Wiel have all recovered from injury, and Boerrgter scored 3 goals in the recent 2 games! Sigthorsson has also scored 2 goals since his comeback. What's making Ajax strong these days is the increasing variety of players who can make a difference on the pitch. De Jong has scored 14 goals this season (and I think it's fair to say that he is already a very dangerous striker), but even when he plays as a midfielder, coach De Boer can send Sigthorsson or Bulykin to the pitch! So these days I often wonder who will be playing on the pitch next season (of course I know it's too early). Vertonghen will surely leave the club, and Van der Wiel will also move abroad. Aissati once expressed his wish to leave the club, and considering the current situation, I don't think Lodeiro will be playing at Ajax next season. De Boer told that he wanted AZ's Moisander or NEC's Nuytinck as potential replacement for Vertonghen. 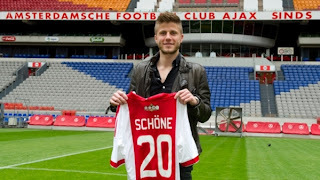 And Ajax recently announced that they reached an agreement with NEC on the transfer of Danish midfielder Lasse Schone. Schone is an offensive midfielder with good vision and technique. He is also good at mid-range shots, so my image of him is something like "(Eriksen + Janssen) / 2". I think he can be used immediately upon joining the team. De Boer said an interesting thing about this transfer. This is what he said. "Lasse fits our philosophy perfectly. He's a creative player who can both score and assist. We like that type of player at Ajax. He’ll have to compete with the other midfielders for a spot. But this season has shown that we really do need everyone. We need a good, broad selection. Earlier this season, we needed to call up some A-juniors. With a good player like Lasse on board, we’ll have even more options next season." So the aim of Ajax is clear; To get more options for midfield. And Shorne himself knows that he is not guaranteed a spot in the squad. But one interpretation of this comment is that the coach does not really want to call young players into the first team squad. This is perhaps because De Boer believes in the academy. Jong Ajax fought the NextGen series and showed great performance (they went to the final and lost against Inter on penalties). Having young players concentrate on their time at Jong Ajax is one way to preserve the Ajax brand. Another target is Heerenveen's Narsingh. He is perhaps the best winger at the moment in the Eredivisie. He is a graduate of the Ajax academy, so he knows how to play at Ajax. He has made 22 assists this season. Just incredible. He already told that he wanted to move to Ajax, so I hope the two clubs reach an agreement on a transfer fee. Moreover, according to Voetbal International, Ajax are keeping an eye on AZ's side back Simon Poulsen. Ajax already have at least three players who can play at left back (Blind, Koppers and Boilessen), but from an objective point of view, I think Poulsen is the best side back among them. Poulsen admits that he is happy to hear the news that Ajax are following him, but he also tells that he wants to play in another league. So that's all I know about transfer news around Amsterdam. I'm looking forward to seeing these players joining Ajax, and I also hope that those who leave Ajax will have a good football life elsewhere.